This book provides a comprehensive, step-by-step approach to organic process research and development in the pharmaceutical, fine chemical, and agricultural chemical industries. Process R&D describes the steps taken, following synthesis and evaluation, to bring key compounds to market in a cost-effective manner. More people are being hired for work in this area as increasing numbers of drug candidates are identified through combinatorial chemistry and high-throughput screening. The book is directed to industrial (primarily organic) chemists, and academicians (particularly those involved in a growing number of start-up companies) and students who need insight into industrial process R&D. Current books do not describe hands-on, step-by-step, approaches to solving process development problems, including route, reagent, and solvent selection; optimising catalytic reactions; chiral syntheses; and "green chemistry." "Practical Process Research and Development" will be a valuable resource for researchers, managers, and graduate students. Provides insights into generating rugged, practical, cost-effective processes for the chemical preparation of "small molecules"
Foreword by K. Barry Sharpless. Foreword by Jerome L. Moniot. Preface. About the Author. Approaches to Process Development. Route Selection. Reagent Selection. Solvent Selection. Running the Reaction. Effects of Water. In-Process Controls. Optimizing the Reaction by Minimizing Impurities. Optimizing Catalytic Reactions. Work-Up. Tools for Purifying the Product: Column Chromatography, Crystallization, and Reslurrying. Final Product Form and Impurity Considerations. Vessels and Mixing. Preparing for and Implementing the Scale-up Run. Troubleshooting. Chiral Syntheses. General Index. Reaction Type Index. Reagent Index. Neal G. Anderson, Ph.D., has worked for over 20 years in chemical process R&D in the pharmaceutical industry. He earned a B.S. degree from the University of Illinois and a Ph.D. in medicinal chemistry from the University of Michigan and completed post-doctoral studies at McNeil Laboratories. With almost 18 years in process R&D at Bristol-Myers Squibb Co. in New Brunswick, New Jersey, Dr. Anderson has extensive hands-on experience in the laboratory, pilot plant, and manufacturing facilities. He has made key contributions to processes for the manufacture of four major drug substances, including captopril, and has participated in 12 manufacturing start-ups and successfully introduced many processes to pilot plants. He received the Bristol-Myers Squibb President's Award and spot awards, and his final position was Principal Scientist.In 1997, Dr. Anderson established Process Solutions L.L.C., a consulting firm offering practical guidance on developing and implementing processes for bulk pharmaceuticals and fine chemicals. As part of these consulting services, he presents courses on selected aspects of practical process R&D. "In summary, we believe that every newcomer to the exciting field of process research and development should read this book, but also experienced process chemists and even academics will find it very useful and stimulating. 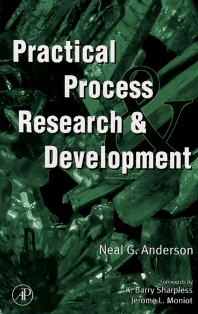 As the language of stock analysts and brokers is very popular today, we recommend Practical Process Research and Development, by Neal G. Anderson, as a "strong buy" because this investment will pay off very quickly." --ANGEWANDTE CHEMIE, 2001, 40, No. 7.